Fill in your details below and we will let you know within 24 hours if we can get Artifacts, Inc. to you with haste! New York, 1929: A frenzy of interest in antiquity is sweeping the nation! With museums hungry for mysterious and exotic artifacts - and you hungry for adventure - you start up your own archeology company. Untold wonders await within dangerous jungles, harsh deserts, and wind-swept mountains. Will you gain a reputation as the most intrepid and famous adventurer of all time? 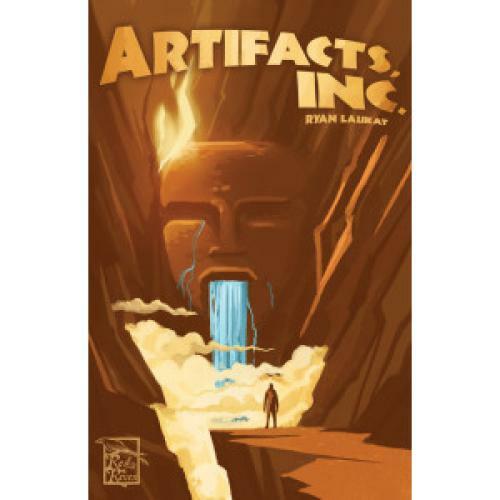 In Artifacts, Inc., 2-4 players compete to grow the most famous archeology company. Players roll dice, which represent their troop of adventurers, and place them on cards in order to find artifacts, sell them to museums, and purchase new cards representing their company assets. Players can choose to focus on making lots of money by selling artifacts, having museum majorities, creating the best combination of expeditions and buildings, or searching below the waves for lost cities and hidden treasures. The first player to reach 20 reputation triggers the end of the game, and the player with the most total reputation wins!